The price of natural stone flooring tile is dependent on three factors. The first is quality, the second is quantity of material purchased, and the third is product source. Installers looking for a good deal on natural or engineered stone for bathroom floors can take advantage of true wholesale pricing when doing business with Nalboor Tiles, an online store featuring the finest selection of top-quality materials from Stonexchange. Popular bathroom flooring tile materials include marble, granite, travertine, and engineered stone. These fabricated tiles are expensive when purchased in small amounts. Importers and distributors have to ship large quantities of product from the quarries or manufacturing plants in order to make a profit. In turn, they offer greatly reduced prices on bulk orders placed by retailers, construction contractors, and outlet supply chain stores.To discover how these natural stone products are made available at below-market cost, read on. We at Stonexchange are proud to offer the finest quality marble, travertine, and engineered stone flooring tiles to be found anywhere, and our exciting new online showroom is the place to go when it comes time to place an order. Bathroom design is somewhat unique. Interior designers attempt to create a fresh, sanitary atmosphere while at the same time making the room as functional as possible. Nearly every homeowner and prospective homeowner dreams of a bathroom that includes walls laden with mirrors, polished fixtures and appliances, and an exciting floor covering made of polished or honed marble, granite, or other natural stone.Of course, figuring in the cost of a stone floor is a task many will dread. The first thing that comes to mind when natural stone tile is mentioned is the prohibitive cost. This is usually realized when a small amount of material is purchased. The extreme weight of natural stone tiles and the precise fabrication procedures undertaken to produce top-quality material is the reason for high retail prices on this family of raw materials.A direct importer such as Stonexchange helps to solve this problem of high per-piece material cost. Not only does Stonexchange import vast quantities of marble, granite, travertine, and other stone product, we do so year-round. We also own our manufacturing operations overseas, meaning we do not have to purchase our stone from a reseller or other import outfit.We offer bathroom tiles for less than any retail outlet. Our natural stone tiles are the result of a specialized manufacturing process that involves the extraction of stone slabs from quarries, grading them according to texture and color, and slicing them into thin sheets. Expert cutters then form the actual tiles, polish or hone them to a smooth finish, and pack them into large overseas shipping containers. These containers are ticketed to the Stonexchange distribution headquarters in Florida. Buyers dealing direct with Stonexchange enjoy the lowest prices in the industry when the product is purchased in bulk quantities. Our Nalboor Tiles showroom is the online source for the finest marble, travertine, and engineered stone tiles available anywhere. The Nalboor Tiles online showroom is your direct link to Stonexchange. Our company offers these fantastically low prices on flooring tiles because we specialize in bulk orders of stone material. Construction companies save a tremendous amount of money when purchasing full-crate or full-pallet orders of marble or other stone material. Homeowners preparing for a major bathroom renovation project are also invited to compare our prices to that of the competition.We ship our tiles to any destination in the continental United States. Whether ordering thousands of tiles for a large development project, a pallet of tiles for an office building remodel, or a small crate of material for a home improvement undertaking, the buyer can rest easy knowing that Stonexchange offers rapid order processing and shipment of bathroom flooring products. Our freight charges are quite reasonable because we are constantly shipping tiles with some of the most reputable overland freight companies in the nation. 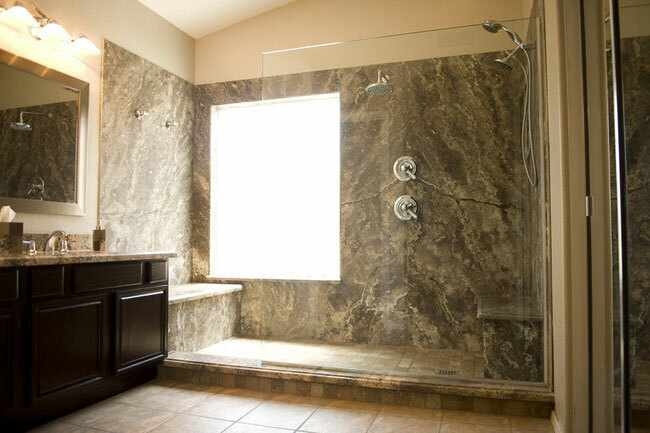 Stonexchange carries a large variety of stone tiles for placement on bathroom floors. We maintain a large inventory of marble, travertine, and engineered stone products, and our marketing experts are constantly checking the construction engineering and design trends to make sure the most desired products are always in stock. Our line of marble tiles includes the most requested styles and colors, and we also keep a large inventory of travertine sheets, suitable not only for covering floors but also bathroom walls. Marble is the preferred bathroom tile. This natural stone has been used for countless centuries. It has a shiny, lustrous appearance, and its unique veining and spotting is the result of both igneous and metamorphic processes. Most of the world.